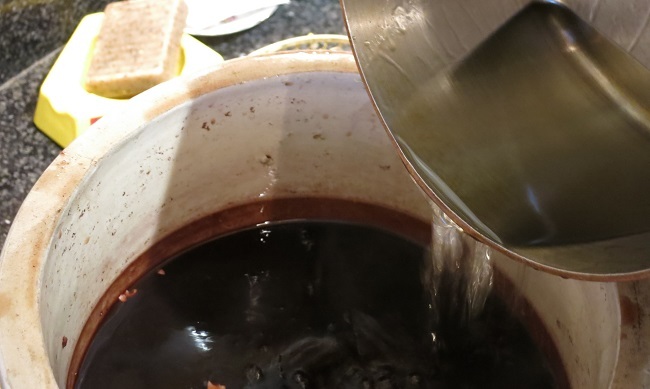 After 7 weeks maceration with green walnuts and walnut leaves, the red wine has become dark brown and slightly viscous. This wine still needs to go into the cellar for 6 months. 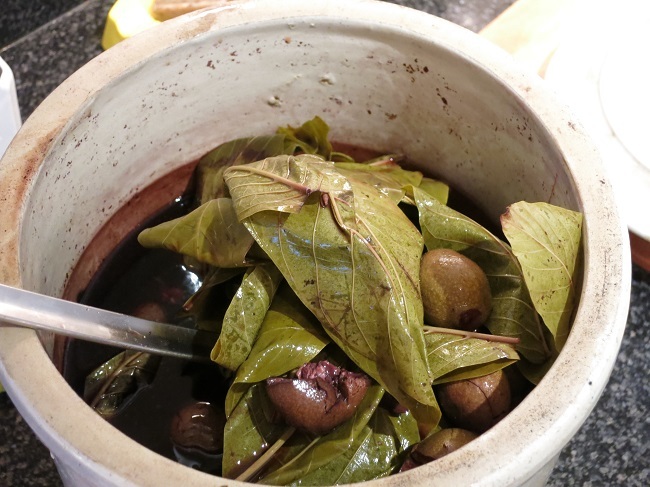 As described in an earlier post, last June I put some green walnuts and leaves to macerate on red wine. A few spices, some bay leaves and a piece of dried orange peel made up the rest of the ingredients, then the whole was safely tucked into an old sauerkraut crock, was tucked into a cool cellar (the storage area in the basement of our condo, to tell the truth) for about 6 weeks. 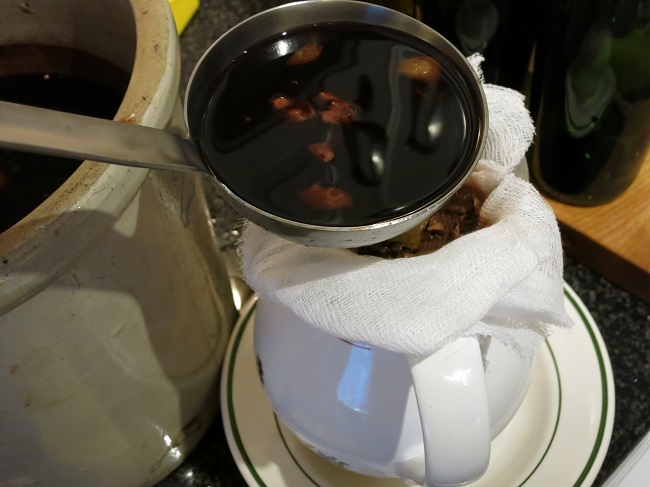 This was the first step in my project to make vin de noix, a fortified wine that has its roots in the walnut-rich countryside of the French southwest. With a rich, nutty earthiness and a slightly oxidized character, vin de noix makes a nice aperitif when poured over ice, or a sweet wine at the end of a meal with dessert or cheese. Basically it fills a similar role that an aged port might play. I finally got around to finishing up this batch of vin de noix in early August. By “finishing”, I mean that after taking on the flavor of the green walnuts during maceration, the wine is ready to be fortified with a alcohol and sugar, then bottled. I have included some photos of the process below. The next step requires the least work: waiting for about 5-6 months to let the alcohol mellow and the flavors of balance. For that, the bottles go back into my cool storage space, to slumber quietly until the end of the year. 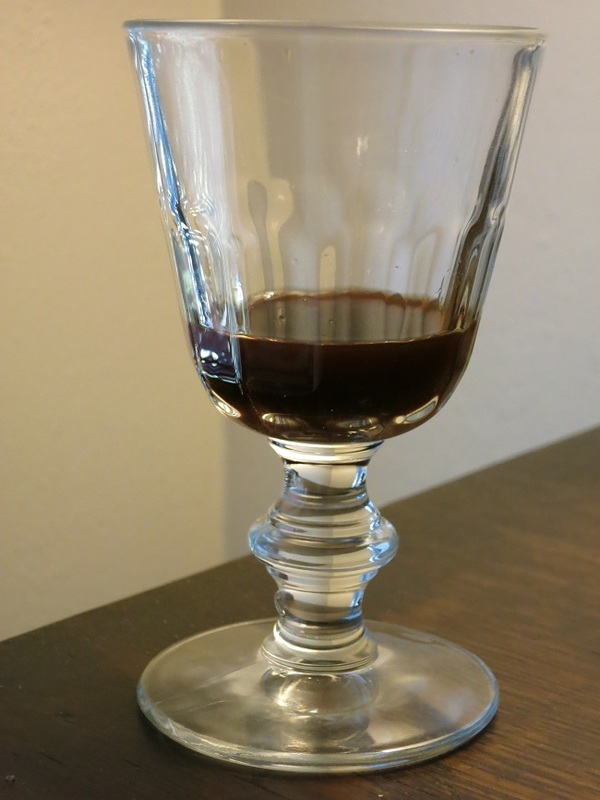 Check out my recipe for vin de noix here. The solids are stained out and any liquid the drains off is returned to the batch of wine. The wine is fortified with vodka into which has been dissolved sugar. The finished vin de noix is strained through cheese cloth before bottling, to remove any sediment. 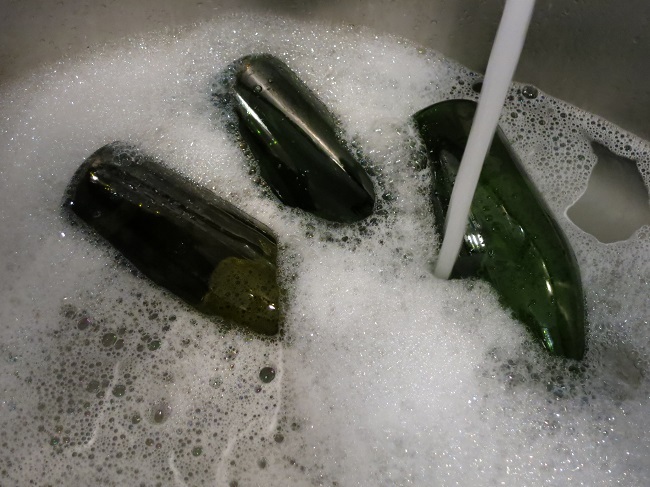 It is important that the bottles to be used by well washed and sterilized. 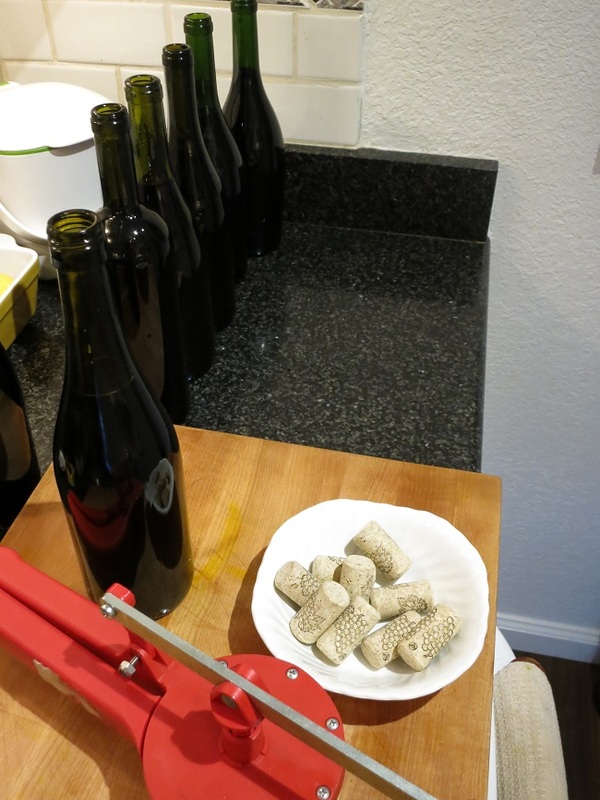 The vin de noix is put in clean bottles and corked. The addition of alcohol is supposed to prevent any fermentation in the bottle due to the presence of wild yeasts. However, occasionally I have had a bottle undergo fermentation and blow its cork out. 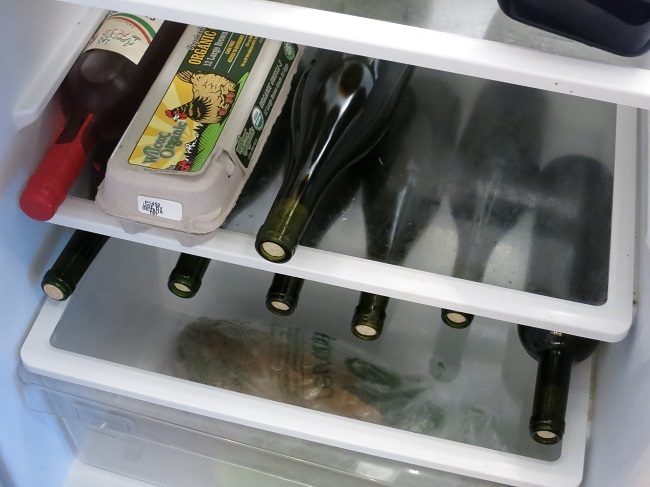 My cellar is fairly cool but here I am taking the precaution of chilling the bottles for a few days before cellaring to make sure any yeast is dormant. 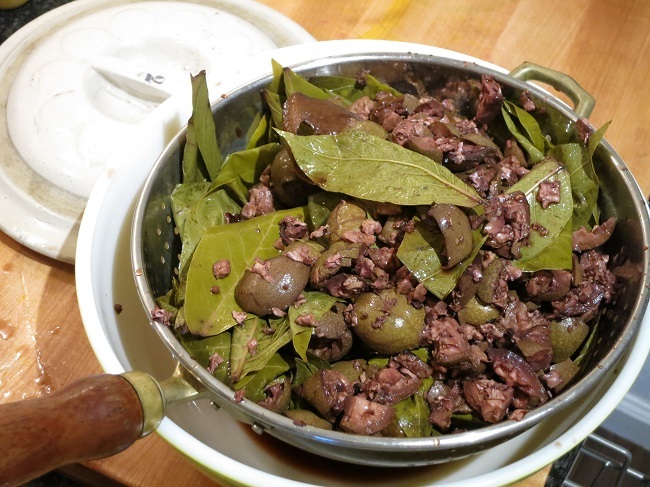 This entry was posted in Stuff and tagged Apero, Walnuts, Wine. Bookmark the permalink.